Near Northwestern University's main campus in Evanston, three young men and three young women live comfortably in an older red brick three-flat on a residential street. The men and women, who live on separate floors, each have their own bedroom; they share chores, and enjoy group outings to Ravinia for concerts and Six Flags Great America for amusement rides. The normalcy is deceiving, for it masks a bold model for what social entrepreneur Kay Branz '87 hopes is a more promising, independent future for young adults with developmental disabilities. "We took a business framework and superimposed it on a community-organizing process," says Branz. In other words, the residence is not a "group" home. It's owned by a private investor, and the Center for Independent Futures (CIF, which Branz cofounded) contracts for services needed by the residents. Rent is a reasonable $620 per month. Branz's mission is both personal and professional, since her daughter Elise Hylton, 26, is one of the residents. Elise has Asperger's syndrome, generally considered a less severe form of autism. The residential model — Community Living Option (CLO) — grew in part out of Branz's frustrations in finding "zero" support for Elise after she graduated from high school. Branz says that Illinois agencies and institutions "had a finger in the dike of a crumbling system," and that the state ranks 48th in services for adults with developmental disabilities. Yet, she says, there is limited future planning or direction, sources of financial support or community-based resources available to these families. And that's the void Branz wanted to fill. The residence has a program coordinator, and a resident "community-builder." Most of all, the CLO carries a vastly reduced price tag of about $25,000 per person — as opposed to more than $100,000 per person for institutional care. 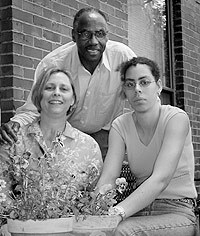 Branz, a self-described child of the '60s and graduate of Smith College in Massachusetts, is married to Glen Hylton (pictured above with Branz and Elise), senior program officer with Chicago Area Project, a statewide community youth agency. They have another daughter Jessica, who recently graduated from Indiana University. Branz met her husband, a Jamaican, during a junior year abroad program at the University of Leicester in England, and the couple lived in Jamaica for four years, where Branz helped start a preschool and worked with children with disabilities. After Kellogg, she worked in marketing communications for diverse groups such as the American Dental Association, a variety of health-care agencies and hospitals, and helped establish a foundation for the Society of Actuaries. In 1999, Branz cofounded the nonprofit Evanston-based CIF along with Jane Doyle, who is the executive director. Friends call Branz a visionary and an idea person who excels at building relationships. "She doesn't just look in her own household and say, 'How can I solve this for myself?'" says Carol Zsolnay, assistant director at the Kellogg School's Center for Family Enterprises. Sara Brewster, vice president for communication at Easter Seals and another long-time friend, says, "She sees it, organizes it in her head and is ready to go." CIF recently helped 13 families purchase another property near downtown Evanston for $1 million; 10 of those families have a child with disabilities. At the same time, Branz is stepping down from formal ties to CIF, in part, because of the tension between doing good — and needing to earn a paycheck. "I have been struck as a Kellogg alum as to how different the female MBA journey has been and how non-corporate the typical journey has become," she says. Part of the journey is stepping away from her creation and looking for new challenges that also engage her. Branz says, "I can't imagine doing any work that my heart wasn't in and in which there wasn't some social value."